The unmistakeable sound of crickets (order Orthoptera) chirping away has lulled many an individual into a cozy nighttime slumber. If you're one of them, you probably associate the cold-blooded insects with the languid relaxation of the warmest evenings of the year, during both the spring and summer months. Crickets tend to be busier and more energetic when the temperatures are high, but that's not why you hear them more clearly when the weather is hot or warm. The audibility of their chirping is actually directly related to how much energy their bodies have. Colder temperatures lead to crickets with decreased energy levels. Warmer temperatures, on the other hand, give crickets energy boosts, not too unlike people. Note that solely boy crickets chirp, and they do so by massaging their wings against each other. They sometimes chirp by massaging wings and legs together, too. This action is known as stridulation. Warmer temperatures don't only lead to crickets being busier and more mobile in general, they also affect the actual speed of their chirps. When it's warm or hot out, crickets chirp at significantly more rapid paces. Crickets are well-adjusted to temperatures within the range of 60 to 80 degrees Fahrenheit -- pretty prevalent on summer evenings. Funnily enough, cricket chirping can actually be a handy and pretty reliable tool for figuring out the current temperature. Simply track how many chirps a cricket produces in a span of 15 seconds. Then tack 40 onto the number you counted. Your final number should actually be similar to the present temperature. Although crickets are predominantly nocturnal creatures, their nighttime chirping habits could be related to the lower, often more comfortable temperatures that darkness brings. Despite that, it isn't unheard of for the noisy brown or black creatures to sometimes chirp in the daytime, too. Beyond the weather and temperatures, crickets' intentions also greatly affect their chirping. If a male cricket feels nervous by another male encroaching on his individual turf, he might just chirp as a means of driving the pesky intruder away. 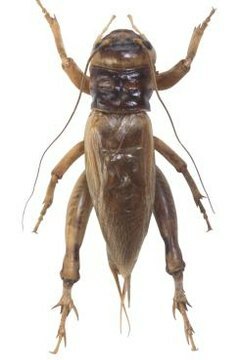 Cricket chirping is commonly done to lure female crickets in for mating, too. Although all chirping might sound somewhat indistinguishable to you, crickets' songs are indeed distinct from one another. No two species of crickets sound exactly the same. Minnesota Pollution Control Agency: Crickets!